1) Soak the self watering spikes in water and generously water plant. Both steps prevent house plant watering devices from pulling moisture quickly from the bottle. 2) Take any long neck glass bottle, such as a wine bottle, and fill it with water. 3) Set the watering spikes for plants on top of the bottle. 4) Flip them over and place plant waterer for pots into your indoor or outdoor planter. and get these awesome plant watering system now! for the refund or replacement. Your satisfaction is our top priority and we strive to offer you the best after sale service. 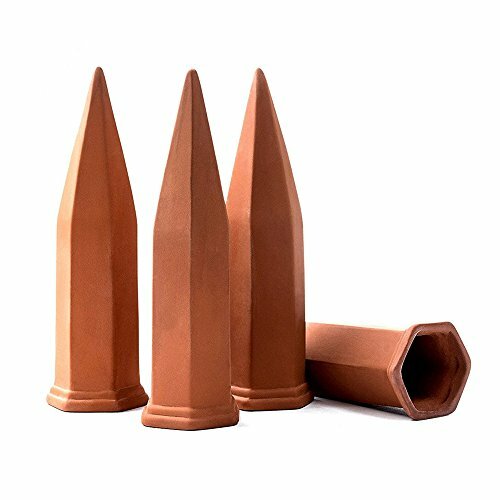 ★PERFECT PLANT WATERING STAKES: Use recycled wine bottles along with these amazing terracotta plant watering spikes to create a self-irrigation watering system. Whether your plants are indoor or outdoor, at home or in the office, these self-watering spikes will keep your plants alive. ★NO WORRIES BEHIND THE VACATION: Without having to worry about finding someone to watering your plants. Usually the 750ml wine bottle reservoir can sustain your plant's watering needs for 7-10 days, depending on the dryness of your soil, air humidity and temperature, etc. We suggested to test these automatic plant waterer before leaving on vacation for the most accurate watering time. ★EFFORTLESS INSTALLATION: Place any long-necked bottle (wine or soda bottles are perfect) onto the stake and simply insert it into the soil, and you're good to go. ★ECONOMICAL AND EASY TO USE: As the water begins to run out, just refill the wine bottles so that your plants stay hearty and robust. This set makes a perfect gift for first-time gardeners or potted plant owners. ★100% MONEY BACK GUARANTEE: No risk purchase here. The plant waterer may get broken due to long distance transportation, feel free to contact us via luss-custom@foxmail.com for the refund or replacement. Your satisfaction is our top priority and we strive to offer you the best after sale service. If you have any questions about this product by Luss Custom, contact us by completing and submitting the form below. If you are looking for a specif part number, please include it with your message. Plant Nanny Purple Spiral Watering Globe with Stake, 24 oz.